"WR6_gUnUj-ztiW07KQcOCnTel9A"/> Notes From Atlanta: Is There Such a Thing as “Hausa-Fulani”? Is There Such a Thing as “Hausa-Fulani”? A reader of this column repeatedly challenged me to justify calling President Muhammadu Buhari a “Hausa-Fulani.” He said he expected me to never give my stamp of approval to the label, which he correctly said was invented, or at least popularized, by the southern Nigerian press. I promised to write on the topic but never got round to doing it. Then, a few weeks back, I had cause to exchange thoughts on this issue with cerebral Marxist scholar and Daily Trust columnist Professor Jibrin “Jibo” Ibrahim, of the Center for Democracy and Development, who is from Kano. Professor Jibo thinks there is a distinct identity that can legitimately be called “Hausa/Fulani.” "In 1903 the British conquered a Caliphate where a Fulani ruling dynasty was ruling the Hausa people and they made a compact with that dynasty. So yes, there are distinct Hausa and Fulani people, well many are mixed, but there is a political category called Hausa-Fulani that draws from the jihad of 1804," he said. I disagree, not least because he invoked colonial conquest as the social and political basis for the legitimacy of his claim. But, then, why did I call President Buhari “Hausa-Fulani” if I disagree with Professor Jibo? Well, when we interviewed Buhari in 1999 at the Weekly Trust, I distinctly recall him telling us that he loved the label “Hausa/Fulani” because it perfectly encapsulates the tapestry of his identity; his father, he said, is Fulani and his mother is half Hausa and half Kanuri. Besides, although he is ethnically Fulani patrilineally, he is culturally and linguistically Hausa. What better label can capture this ethnic and cultural coalescence than “Hausa-Fulani,” he asked. Well, I like to respect and call people what they call themselves. But many northern intellectuals, including the late Dr. Yusufu Bala Usman, Professor Jibo’s former teacher, resent (in the case of the late Dr. Bala resented) the label “Hausa-Fulani.” As someone who studies the rhetorical construction of identities, I also think “Hausa-Fulani” as an overarching ethnic category for people who live in Nigeria’s far north is meaningless. And here is why. It isn't only in Hausa land that Fulani dynasties ruled over, merged with, and became culturally indistinguishable from their non-Fulani hosts. You can find examples of that sort of cultural and ethnic alchemy in Nupe land and in Ilorin, yet we don't have fossilized hyphenated identity labels for these people. In other words, there are no "Nupe-Fulani" or "Yoruba-Fulani." So why should there be "Hausa-Fulani"? 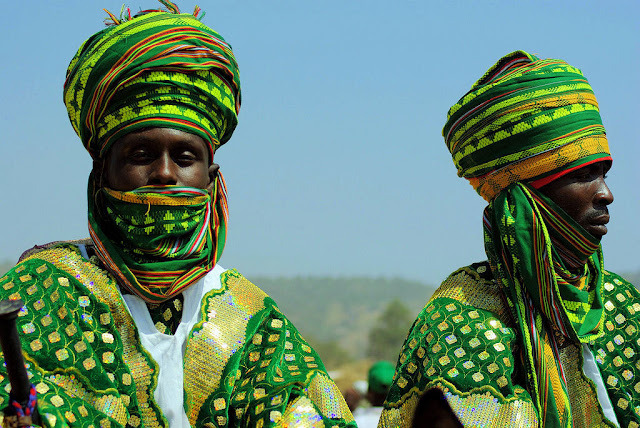 I admit that the cultural and ethnic melding of the Hausa and the Fulani people (whose languages are not only mutually unintelligible but also, in fact, belong to different language families) is on a scale of intensity that is unexampled anywhere in Nigeria—perhaps in Africa—, but that doesn't, in my opinion, justify the appellative hyphenation many of us have become fond of. In most Nigerian cultures, descent is traced patrilineally. I am Baatonu because my father, my grandfather, my great-grandfather, etc. are—or are thought to be—Baatonu; the ethnic identity of my matrilineal lineage is immaterial to the determination of my ethnic identity. Nor are my contemporary associational, cultural, or linguistic identities factored in in determining my ethnicity. A person who is patrilineally Hausa is Hausa irrespective of the amount of Fulani blood in him or her, which makes the hyphenation of "Hausa" and "Fulani" pointless. What I have described above is broadly true of most African societies. (Certain matrilineal Ghanaian societies are notable exceptions here). That's why the Luos of Kenya regard President Barack Obama as a Luo. Although he is culturally American and has no connection with the Luo cultural and linguistic universe, except on a vicarious and symbolic level, he is seen as "authentically" Luo by the Luo in Kenya and elsewhere. The Luo would most certainly have never had this much emotional investment in Obama's “Luoness” had he been Luo only on his mother’s side. So the hyphenation of ethnic identities on account of cultural, ethnic, and linguistic commingling is an anthropological anomaly on the African continent. Although the "Hausa-Fulani" label has come to stay, it can't be justified historically, linguistically, or anthropologically. In its present form, it was invented by the southern Nigerian press, which lacked the historical and sociological resources to make sense of the ethnic complexity of Nigeria's (far) north. So they manufactured a convenient, if problematic, label. Professor Jibo disputes this. “[John] Paden's book on Ahmadu Bello draws attention to the formation of a Hausa-Fulani political identity in Barewa College way back in the 1920s,” he said. But that doesn’t really say much. We talk of a “Hausa-Fulani” identity today not because some barely mature high school students with vague, inchoate ideas about identity thought it into being; we do because the label enjoys repeated media mentions and validation. In his classic book titled Imagined Communities: Reflections on the Origin and Spread of Nationalism, Benedict Anderson tells us that the emergence of identities in Europe was enabled by the symbolic power of “print capitalism,” by which he means newspapers and books. That was why Buhari, an enthusiast of the “Hausa-Fulani” label, told us in 1999 that one of the greatest, if unintended, favors that southern newspapers have bestowed on the far north was their invention and popularization of the Hausa-Fulani label. Nevertheless, one of my quarrels with the label is its notorious imprecision. For instance, the late Sir Abubakar Tafawa Balewa was and still is often called a “Hausa-Fulani” by the southern press even though he was born of a Shuwa Arab father and a Fulani mother. Another problem with the label is that it erases the identity of millions of ethnically and culturally “unmingled” Fulani people in Nigeria’s northeast and elsewhere. Former super permanent secretary Malam Ahmed Joda once told us at the Presidential Villa (when I worked there) that the first time he left his native Yola to Lagos in pre-independence Nigeria he couldn’t speak a word of Hausa, but Yoruba people in Lagos couldn’t wrap their heads around that. It made no sense to them that a Fulani man couldn’t speak Hausa since both identities have been conflated and made to seem indistinguishable in the popular media. The examples are legion, but the point is that "Hausa-Fulani" is an inexact, endlessly kaleidoscopic identity label that even includes non-Hausa-speaking Kanuris and all Hausa-speaking northern Nigerian Muslims who are ethnically neither Hausa nor Fulani.